Scroll down for a printable Map Of Delaware. The above US map shows the location of the state of Delaware in relation to other US states. Read on to find out fun facts about Delaware, and also find links to other free printable maps. Delaware was the very first state admitted to the union, on December 7, 1787, earning Delaware its nickname, "The First State." 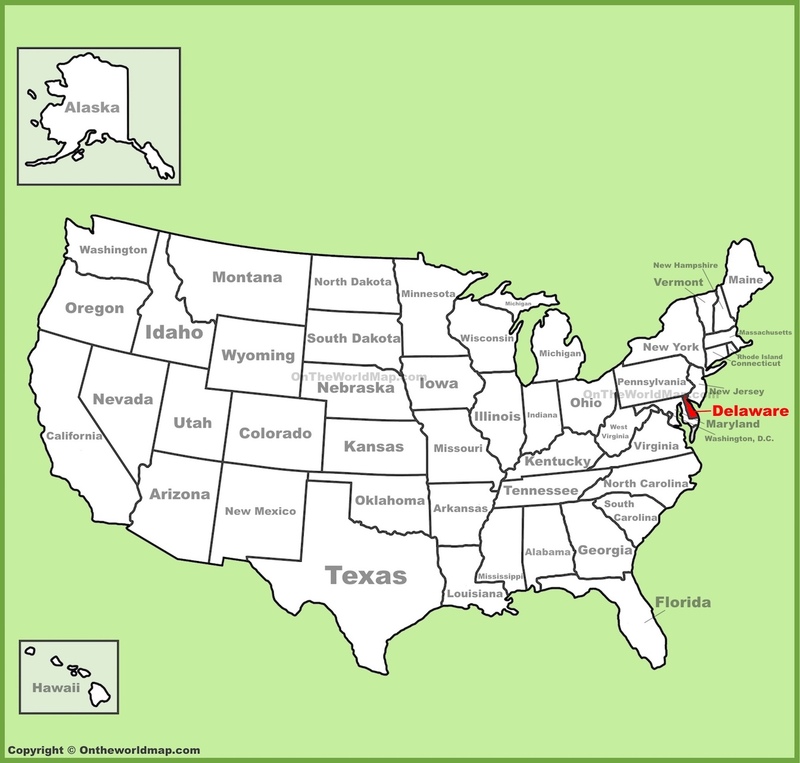 The entire state of Delaware has a land area of less than 2,000 square miles, making Delaware America's 2nd smallest state, larger only than the state of Rhode Island. Driving across the state of Delaware from east to west (or west to east) takes less than one hour. Delaware is home to fewer than 1 million people. Native tribes from Delaware (i.e. Delaware Indians) called themselves Lenape. Delaware is he only US state with no national park, although is does have quite a few state parks. Several of Delaware's state parks feature disc (frisbee) golf courses. There is NO sales tax in the state of Delaware. Delaware is very popular for its beach resorts, Rehoboth Beach being a tourist favorite. Muskrat is a popular delicacy in the state of Delaware. Try some of these delicious Delaware Muskrat Recipes. Wilmington, Dover, Newark, and Rehoboth Beach. Go here to see all sorts of Free Printable Resume Formats.